A delightful personal account of India’s space program from the very beginning. With personal memories from an era that otherwise would be lost. This is an important historical record of events that will in a few years be lost entirely in living memory. It is a non-technical account written by an engineer. The co-author Gita Aravamudan’s, experience in journalism is no doubt a key factor in the succinct and easy to read the narrative style. As expected it is the personal anecdotes that really make this a fascinating reading. The reference to “chase a chimaera” wonderfully captures the extraordinary goal Sarabhai had set for India of 1962. Aravamudan’s personal accounts of meetings and working with Sarabhai, Bhabha and Kalam. While at NASA Wallops, his meeting the engineers from Pakistan captures a unique moment when the two neighbours’ space programs were at a stage of capability. Visits by the Dalia Lama, J.R.D Tata, confrontation with local fishermen and union disputes paint a richer picture of Thumba than I had not come across before. The first-hand account of travelling to Australia to purchase a fully functioning telemetry station has surprising twists and turns. The public display of a moon rock at Sriharikota caught the imagination of the local population who turned up in unexpectedly large numbers to view it. During his time as a director at Sriharikota, he describes the administrative burden of managing the town-like scale of the centre. As the director, he was responsible for the operations of a school, hospital, shopping centre, mosque and a temple in addition to managing the space missions. The authors remain apolitical and consistent with similar books by former ISRO employees. Naturally, the author is proud of his contribution and occasionally exaggerating ISRO’s achievement (i.e. ISRO being the first agency withMars Orbiter Mission to succeed with orbiting Mars on the first attempt). I would have liked to have seen more about the exchanges between the Indian and Pakistani engineers when the met at Wallops. 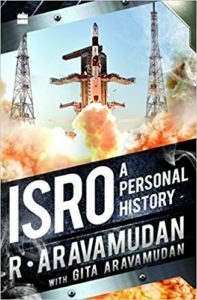 Historians of the future will be indebted to Aravamudan and his wife for chronicling a unique episode in India’s journey as a space power.